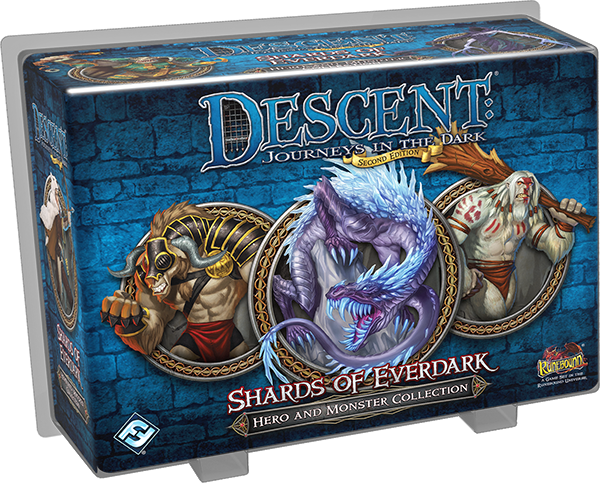 Descent is a game of nearly infinite expansions (so it sometimes seems). The original game had quite a lot released for it. Then came the new edition. Well, to make sure you can play all those old expansions with your new rules, Fantasy Flight Games has been coming out with those sets, but with updated rules (also good for those that took 2nd edition as a good place to jump into the game). The Shards of Everdark Hero and Monster Pack is now available. But Shards of Everdark isn't just "old material made new." There's also entirely new stuff inside. Those would be the Dark Minotaurs. They're accompanied by the Ice Wyrms and the Shades. A pair of entirely new quests also comes in this kit, giving you more ways to play the game. You can pick up this set at your local gaming store (or, at least, they should be able to get it in for you), or you can order it direct from FFG.